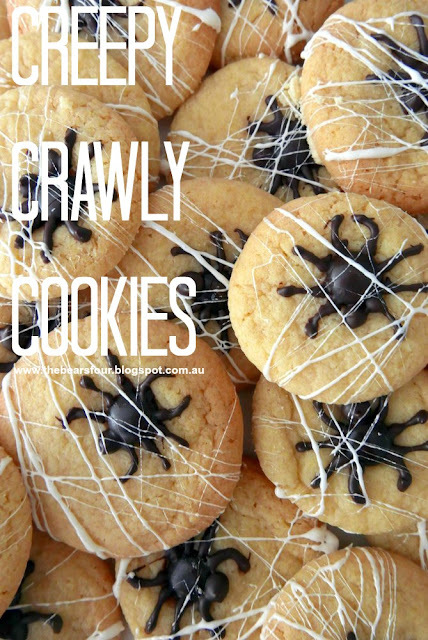 You may remember the creepy crawly cookies post from last year (you can find it here), well they got a revamp! To learn how to make them super spookie, with the addition of spider webs, click below. Step 1: Preheat oven to 160 degree Celcius fan forced. In a mixing bowl mix together flour, cornflour, baking powder, baking soda and salt. Set aside. Step 2: In another mixing bowl, using an electric mixer, mix together chilled butter, sugar, honey and coffee creamer until blended. Add in egg and vanilla extract. Step 3: Slowly add your dry ingredients until completely combined. Roll spoonfuls of cookie dough (about 1.5 tablespoons) into balls and place 2 inches apart on a cookie sheet lined with baking paper. Lightly flatten the cookies and place one M&M in the centre. Bake for 10-12 minutes or until slightly golden just around the edge of the cookie. Step 4: Allow cookies to cool. Over a bain marie melt the dark chocolate. Leave to cool (but not harden) for 10-15 minutes. Once cooled, fill the piping bag with the dark chocolate and pipe a small ball next to the M&M, which will be the spider's head. Next pipe eight lines (four on either side) of the M&M, which will be the spiders legs. Place cookies in the fridge until the chocolate has hardened. Step 5: In a microwave safe bowl, microwave 6 marshmallows for 30 seconds. Let the melted marshmallow rest for a few minutes as it will be very hot when you first take it out of the microwave. Next, take a teaspoon of melted marshmallow between your thumb and pointer finger and open your fingers to stretch out the marshmallow until it forms thin strings. Wrap the marshmallow strings around the spider cookies. Repeat for each cookie, then place them on a sheet of non-stick baking paper in the fridge to set. A simple and totally scary halloween treat!